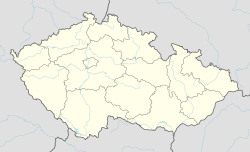 Postoloprty (Czech pronunciation: [ˈpostolopr̩tɪ]; German: Postelberg) is a town in the Ústí nad Labem Region of the Czech Republic. The town is situated in the northwest of the historic Bohemia region, about 7 km (4.3 mi) west of Louny. It has around 5,000 inhabitants. A distinctive geologic outcrop of the Cretaceous period is located near the village of Březno (Březenské souvrství); it is today rated as a protected natural monument. The municipal area comprises the cadastral communities of Březno, Dolejší Hůrky, Hradiště, Levonice, Malnice, Mradice, Postoloprty proper, Rvenice, Seletice, Seménkovice, Skupice, Strkovice, and Vrbka. The settlement was first mentioned in the Chronica Boemorum, written in 1119–1125 by the Bohemian historian Cosmas of Prague. A Benedictine monastery dedicated to the Blessed Virgin Mary was founded here in the early 12th century; near the site where a former Slavic gord (Drahúš) on the Ohře river had been erected at the behest of the Přemyslid dukes. Later the abbey was named Porta Apostolorum, which developed into Postelberg, as the settlement was called by the local German-speaking settlers that arrived here in the course of the medieval Ostsiedlung migration. The monastery's premises where devastated during the Hussite Wars in 1420 and not rebuilt. In 1454 the Bohemian king George of Poděbrady enfeoffed his sons with the Postoloprty estates. The lands were leased to the noble Veitmile (Weitmühl) family in 1480; soon after, the citizens obtained town privileges by King Vladislaus II. In 1611 the owners had a castle erected at the site of the former monastery, which was rebuilt in a Baroque style from 1706 to 1718. The lordship had passed to the noble House of Schwarzenberg in 1692, the family held the premises until 1945. Upon the 1938 Munich Agreement, the area was annexed by Nazi Germany and incorporated into the Reichsgau Sudetenland. When the region returned to the Czechoslovak Republic at the end of World War II, the remaining 'Sudeten German' population was expelled according to the Beneš decrees. Outrages culminated in a massacre on 3–7 June 1945, when about 800 German civilians, mainly men who had been deported to Postoloprty from nearby Žatec, where tortured and shot. The incidents were inquired by a committee of the Czechoslovak parliament in 1947. It is the largest known killing of ethnic Germans by Czechs after World War II. 763 bodies were exhumed but other death toll estimates are higher. The Postoloprty citizens disagreed whether to build a memorial or to not acknowledge the massacre; a memorial plaque was unveiled on 3 June 2010. ^ Stoldt, Hans-Ulrich. "Revenge on Ethnic Germans: Czech Town Divided over How to Commemorate 1945 Massacre." Der Spiegel. 4 September 2009 . Retrieved on 15 June 2016. Wikimedia Commons has media related to Postoloprty.